This page was printed from http://www.crosleycompany.com/results/. Visit www.crosleycompany.com for more information. "Growth is a team sport. With the right playbook, and players in the right positions, the firm transforms into a revenue growth environment, and the whole becomes greater than the sum of the parts. Partners close more large opportunities, junior people heighten the firm's visibility, natural rainmakers generate more leads, niche sponsors firmly establish their offerings, gifted speakers get on the speaker circuit and the revenue growth flywheel gains momentum." When given the right tools and support, it is possible for any practice to achieve tremendous growth. Practice growth success is never realized through a one-size-fits-all approach. 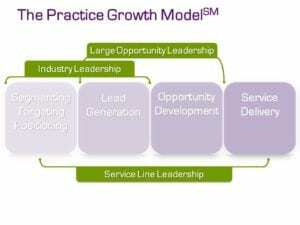 Firms attain their goals through individualized techniques and services based on the results-driven Practice Growth ModelSM. Your firm is assessed to identify potential areas of opportunity, obstacles to growth and natural resources unique to your firm that you can leverage. Giving you a preview of the most likely areas of potential, the process culminates in the development of a comprehensive practice growth plan – a roadmap highlighting specific implementation recommendations tailored to your firm. Results tend to be best when a firm implements the full Practice Growth Model, however, offerings can be customized and delivered individually as well. Either way, working together we will put your firm on track to increased revenues and greater reach so you can enjoy the success you desire and deserve. The firm has seen a shift in mindset where all players have a defined position and play on the same team. Everyone contributes to overall success, whether it’s running a service line or industry, managing the Client Opportunity Planning process or closing an opportunity with a carefully selected team. Even if another firm has a stranglehold on a particular industry niche, there is always a way in. Finding “market holes” is the key to establishing a firm’s rightful place in the ecosystem and developing a following of new clients. By properly leveraging and implementing Gale’s Research Call℠ strategy, this niche leader found a unique way into this market. Growth is their number one priority, and with renewed focus on it, positive peer pressure ensued. More people are involved in opportunity pursuit because it’s culturally important and a great way to earn recognition. The pipeline now serves as the firm’s financial statement of opportunity management and is as important as its balance sheet or income statement. This firm now has both the focus and the systems it needs to make healthy and sustainable pipeline growth a reality for years to come. The firm has found a whole new cutting edge industry to target, a market hole ripe for them to fill, and new distribution channels in several of their industries. Back on a growth trajectory, they are on fire with excitement about their growth prospects.